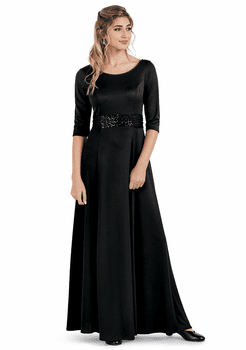 Our 3/4 sleeved long formal gown is made in our soft and stretchy polyester knit. We added a shallow scoop neckline for modesty and a back zipper for ease of wear. The sequined waist band gives way to a non-sequined tie in the back. This allows for a more tailored look. FWO Extras: For best results, we recommend that you Hand Wash and Drip Dry this garment.